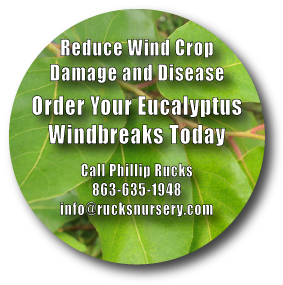 Phillip Rucks Citrus Nursery, Inc. was established by Phillip Rucks in 1997. With over 25 years of experience Phillip Rucks Citrus Nursery is the largest screened commercial citrus nursery in the US with propagations of one million trees annually. The operation is a full service self-contained containerized citrus nursery that grows only the highest yielding citrus trees. The propagation assurance originates from the latest seed source clones and screened disease free budwood houses. The nursery also propagates windbreak trees for citrus canker deterrent and is a low chill licensed propagator of Florida peaches. Phillip Rucks Citrus Nursery has a dedicated staff and facilities to insure the future preservation of the Florida Citrus Industry along with other agricultural entities for years to come.